The Government of Sri Lanka (GoSL) intends to improve the railway system in the Western Province, including the Colombo Metropolitan Region (CMR), which has a population of 5.8 Million people. At present, the railway system carries about 13% of passenger transport within the CMR. GoSL aims to substantially increase the share of the railway for passenger and freight traffic, by improving and modernizing the Sri Lankan railway network in the CMR. This network covers four heavily congested major passenger corridors, namely the Main Line, Coastal Line, Kelani Valley Line and Puttalam Line. 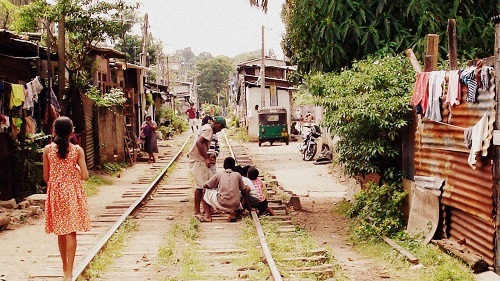 The Kelani Valley (KV) Railway Line, is one of the four major corridors of the Sri Lanka Railway (SLR). The line extending from Maradana to Avissawella is 60 km, with a daily passenger volume of 14,600. It connects several important and highly populated suburbs east of Colombo such as Nugegoda, Kottawa, Maharagama, Homagama, and Avissawella with the City Centre. Currently, this winding single-track railway is not functioning to its full potential due to structural and encroachment issues as well as deteriorated infrastructure. Although the original narrow gauge was developed into a broad gauge in the 1980s, the trace line was kept intact. As a result, the line speed was critically curtailed, averaging at 35 Km/h and thereby substantially reducing the potential of the line for passenger and freight transport. To address these issues, the MoT&CA/SLR has commenced the rehabilitation of the KV Line, particularly to convert the existing single line to a double line and install signaling and electrification systems. Therefore, this task would necessitate the resettlement of communities occupying the land required for the expansion of the railway line. UN-Habitat is undertaking the Socio-Economic Survey of the affected population and will thereafter develop a Resettlement Plan for the communities affected by the implementation of the KV Line Rehabilitation Project. Overall objective: To ensure that sustainable and participatory approaches to development-induced resettlement is carried out and the new settlements are habitable spaces to live in. Specific objective: To assist the MoT&CA/SLR in developing a Resettlement Plan (RP) for the affected communities of the KV Line rehabilitation, that is participatory, inclusive and sustainable. Objective of UN-Habitat’s Assignment: To prepare the Resettlement Plan for the construction of a double track in the Maradana – Homagama section of the Kelani Valley railway line, to be improved under the Colombo Suburb Railway Project (CSRP). UN-Habitat will be guided by international safeguard principles, i.e. ADB’s Safeguard Policy Statement 2009 and the GoSL Land Acquisition Act and subsequent Land Acquisition Regulations as well as the National Involuntary Resettlement Policy 2001 (NIRP) formulated with technical assistance from the ADB. Furthermore, the resettlement planning will be informed by the following key principles: (a) Placing people at the center of decision making, action and responsibility; (b) Ensuring superior post-resettlement living conditions; and (c) Meeting internationally recognised social safeguards in undertaking resettlement. UN-Habitat will work closely with the MoT&CA/SLR and other key stakeholders in implementing this project. A participatory methodology will be followed where the community and the APs are engaged and their views and ideas sought, and where feasible, changes to the designs will be made. Challenges and issues along with community suggestions for solutions will be communicated to the Government of Sri Lanka. All stakeholders will be made fully aware of the purpose of the initiative as part of the social safeguards and principles underlying the approach. Formats developed for data collection will be discussed with the Affected People (APs). UN-Habitat will utilise a flexible and practical approach, given the need to adapt to the ground situation. As such, field visits, Focused Group Discussions (FGDs), Key Informant Interviews (KII) and surveys will be adapted to suit the local conditions. In developing the RP, UN-Habitat will incorporate planning perspectives and ensure consistency with urban development plans that are already approved or under preparation. Concerns regarding disaster risk reduction and climate resilience will also be addressed. Where appropriate, international good practices and experiences will be shared and replicated in implementing the project. 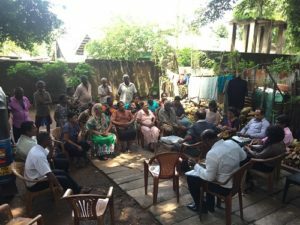 Socio-Economic Survey of affected families along the KV line (Maradana to Homagama). Communities in target locations are consulted and their needs and aspirations are considered in the resettlement options offered. Sustainable settlement planning for the affected community offering improved and resilient measures, and necessary improved community infrastructure facilities. Awareness creation among all stakeholders engaged in resettlement of communities on the participatory process.